Happy Yuletide and Solstice, to everyone. 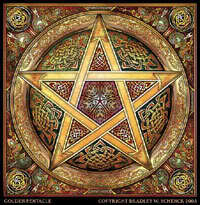 WiccanWay » Chat it up » Happy Yuletide and Solstice, to everyone. I wanted to take this time to share something I came across today, and to wish everyone a HAPPY YULETIDE!! 'Twas the night before Yuletide in the Horde's hall Not a person was stirring, not even a thrall. The wineskins were hung on the mantle with care; in hope that great Odin soon would be there. The clansmen were snoring, passed out on the floor. I made to join them; I couldn't drink more. I found a place quickly, my furs for a bed. The mead I had drunk had gone straight to my head. A noise then came from way out in back. So loud that I swore, we were under attack! I leapt from my furs, my sword clutched in hand, And went to the window to survey the land. I looked into the night and muttered a curse, Could it be Grendel or something much worse? Then what to my eyes should the full moon reveal, But an old fashioned sleigh drawn by a creature unreal. And a huge burly driver so fierce and forbodin', I knew in a moment it was Allfather Odin. He yelled at the creature with a snarl on his lips, And after each word, gave a crack of his whip. "Obey me now, Sleipner, for I am your master, An eight-legged horse ought to run faster!?" I ran from the window, so quick and so able And sought a safe haven under the table. I heard the sleigh stop and Odin get out And as he drew nearer, gave a great shout. He kicked the door open, which then hung askew And I shook when I saw him, what else could I do? He was dressed in his armor, so regal and fine But I caught a strong odor of cheap women and wine. His bundle of weapons he dropped where he stood, All bright gleaming steel and dark polished wood. His face was like granite with a long flowing beard His one eye glowing like an ember, or so it appeared. 4 Re: Happy Yuletide and Solstice, to everyone.